Happy Wednesday! I do hope all of you who live on the East Coast faired well in this crazy storm that barreled into your lives so rudely! It's hard to see those pictures of NY and NJ with so much water and in despair. My dh is from NJ so we are familiar with many of those places they are showing on TV and we just can't believe it. Let's relax a bit and talk Hoedown! This weeks image and challenge is fun to play along with! The Hambo image is Cactus and the challenge is to use Neon. Yep... Neon. If you are like me, that is pretty far fetched, but I dug way deep into some old piles of cs I still had and actually found a neon green one! The picture doesn't show this green to be very neon, but I PROMISE... it is! :) I colored the image with Copics and used my CB embossing folder for the bg. I then made the bottom border using MFT's die-namic crown border which I enhanced using Liquid Applique. Of all times I did not have some pom pom ribbon, the applique had to do! This image just screams pom poms... The ribbon is from my scrap stash which is a wired border and it helped when pleating. 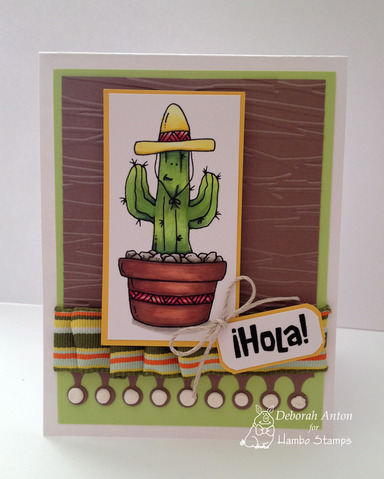 I then finished it off with the sentiment 'Hola!' and a twine bow. We hope you will join us this week! Today is the LAST day of the Hogtoberfest Sale going on at Hambo Stamps! 30% off everything (except cling cushion) including digis! How can you pass it up! Now is your chance to get all those stamps you wanted at a great price bringing laughter to someone's day! Happy Monday... although not so happy for my East Coast friends! I do hope those of you being affected by Sandy stay safe and are careful. Today I want to share with you some treats I made for the teachers- Witches Hats. 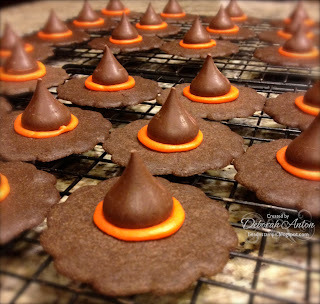 You have probably seen them around made with Fudge Stripe cookies. Thanks so much for stopping by and taking a looksy! Stay safe friends! It's HOG-tober Fest at Hambo Stamps! SALE! It's that time again! Hambo Stamps big 30% off sale! Everything in the store is on sale- including Digis AND the already discounted sale section! (excludes cling cushion) You can't beat the price to add some laughter and a smile to someone's day on your next creation. Stop by and check it out! After you are done buying, head over to the Hoedown blog to see this weeks challenge and what creations the Bacon Bits have come up with. There's No Man Like... A Toothfairy? Wednesday is here... Let's Hoedown! 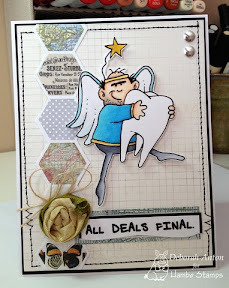 And this weeks challenge uses a different, yet fun image called Tooth fairy. He's, yes... I said he is ready to make all deals final! With that, you are to incorporate hexagons in the challenge. My feminine but manly card, (is there such a thing?) uses the Tooth fairy image paired with some dp from MME. I used some seam binding from The Stamp Simply Ribbon Store make the hand rolled rose and some May Arts jute twine behind it. I sewed around the edges and cut out the image to pop up. What you can't see, and I tried to take a picture, is on the wings, I have a light coverage of glitter used from my Marvey Glitter pen. I will have to save this card for when one of my boys loses a BIG tooth! Lol! 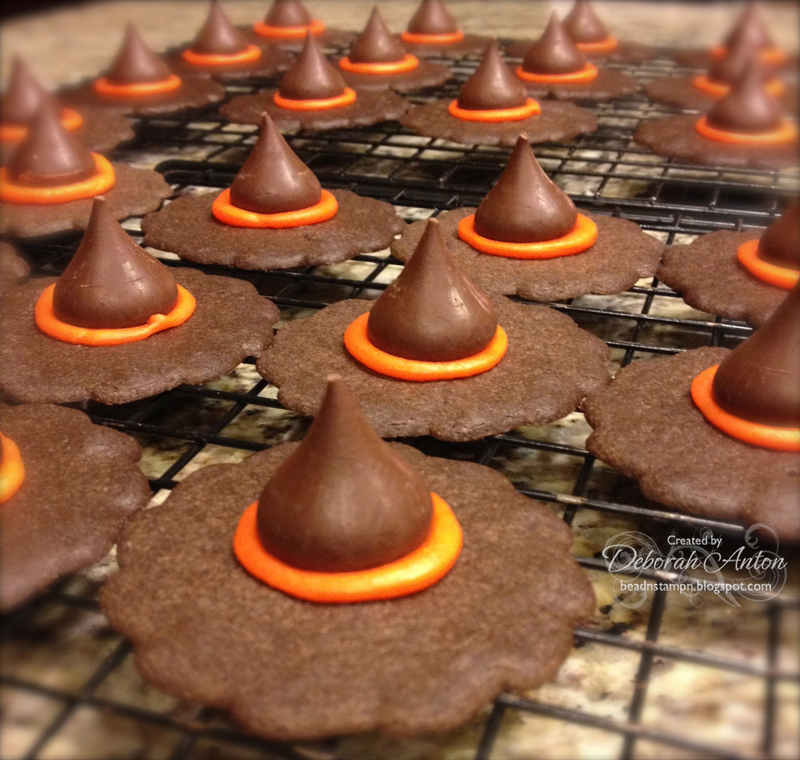 Be sure to stop by the Hoedown blog to check ou the other creations the Bacon Bits came up with! And play along to receive next weeks image for free! Thanks so much for stopping by and have a great day! Play along with us and you could win $10 in store credit! 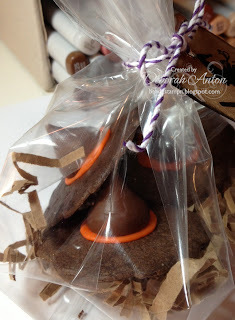 Check out the blog for the other DT creations and what the inspiration did for them! Supplies Used: CYDI? 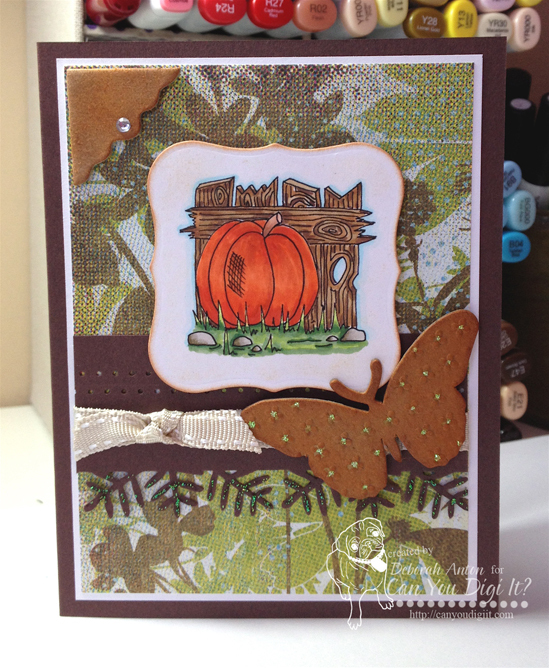 Pumpkin, Copics, Cosmo Cricket dp, chipboard, distress inks, MS Leaf boarder punch, ribbon. I had a friend asked me for a card for her friend's birthday. I went through my stash and wasn't happy with what I had for her so I made a new one using a Pure Innocence set from MFT that is really for Christmas but I turned it to this. I used some dp from Authentique's Free Bird collection and handmade the rhinestone flourish. I sewed around the edges and used some felt from MFT along with the mini rose Die-namic die for the flower. I finished that off with a rhinestone and some twine behind it. The image was colored using Copics and cut out using a Die-namic made for the sentiment set I used for this. I then popped it up. I finished the inside simply. Just some matching cs and dp along with the same image partially. I hope her friend enjoys it! Thanks so much for stopping by and taking a peek! Have a great Thursday! Are you ready to Hoedown? This weeks challenge is to incorporate circles! 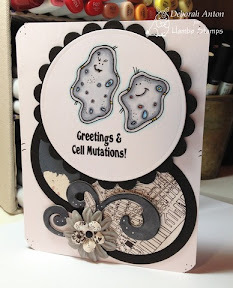 For my card, I used this weeks image of Cells with some dp from Crate Paper's StoryTeller. I cut out the circles with my Nesties and used a chipboard flourish that I colored with my Copic to finish it off. The final touch was made with a Prima and some similar cell markings along the edge of the card. We hope you join us this week for the challenge! Do you Pinterest? 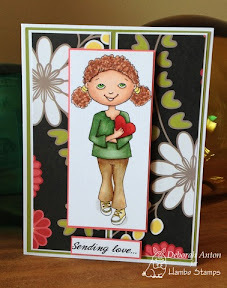 Be sure to follow Hambo Stamps for great projects and inspiration! Thanks so much for stopping by! Can You Digi the News? Boy, is it hard to get back into the groove! My kids had Fall break last week and we hightly enjoyed ourselves! 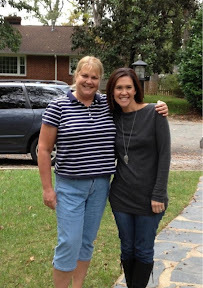 We took a little trip to VA and relaxed at home. Now, it's back to the grind and doing what needs to get done! I am starting off the week with some news that I am happy to share. I have been asked to join the Can You Digi It? Design Team! Here is a card I made using Frankie for a fun Halloween card to start the term off. Check out the site for fun images and products to make your creations! I look forward in sharing with you my creations with CYDI? 's images! Materials for this card include: X-Press it cs, Copics, MS dp, Buttons, Ribbon F/X, MS border punch, and pop ups. Thanks for stopping by and taking a peek! But for the Hoedown challenge, it's to watercolor! Remember that? This was challenging for me as it certainly had been a long time since I had done that. I printed the image on watercolor paper and used my old SU! Inks to color in. I used some dp from Basic Grey and finished it with some ribbon I rouched and some metal embellishments. I used my Fiskars edge punch for opening of the card to complete the look. Thanks for stopping by to peek and I will leave you with the picture of Monica and I! Have a great day! It is the start of Fall Break for us and we are taking a long weekend trip! 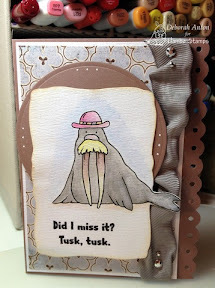 But being WCMD, I wanted to share with a card I made a little bit ago. The image is colored with Copics and the dp is AC. 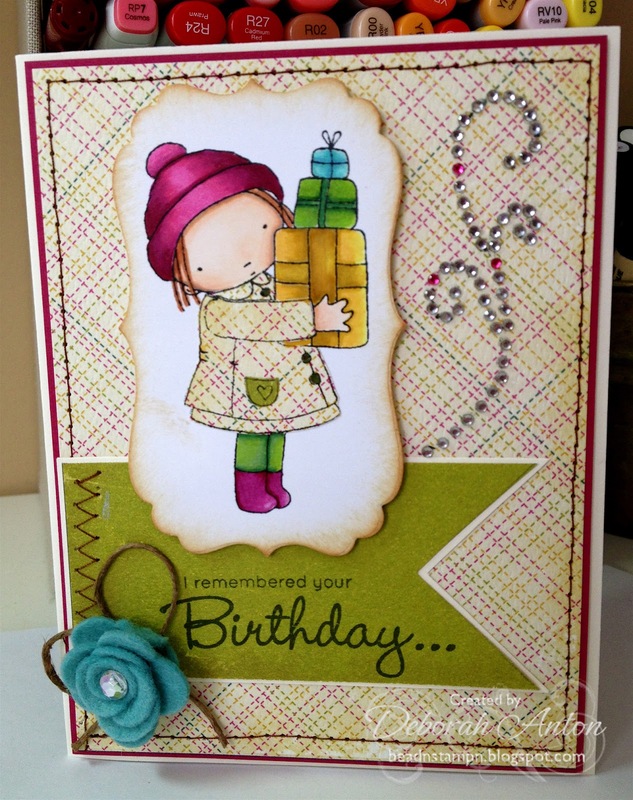 This image is from Hop Art Designs for Hambo Stamps. Proceeds from the sale of these designs goes to Operation Write Home. Today is a perfect day to support this fabulous organization by either contributing your beautiful creations so a soldier can write home, or to purchase a digi so that the money can help in postage! 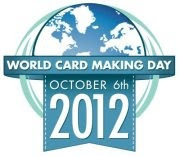 I hope you get to get crafty today and win some great prized featured through various companies! :) We will be driving... And driving... Have a great day! Happy Haunting... And Another Term as a Bacon Bit! That's right! I have been asked to stay another term with Hambo Stamps and I couldn't be more excited! I just love the Bacon Bits and this company! Thank you to Monica and Judy for allowing me to share my creations again with you all using some awesome images and funny sentiments from Hambo! With that, it's Wednesday so it's time for a Hoedown challenge. 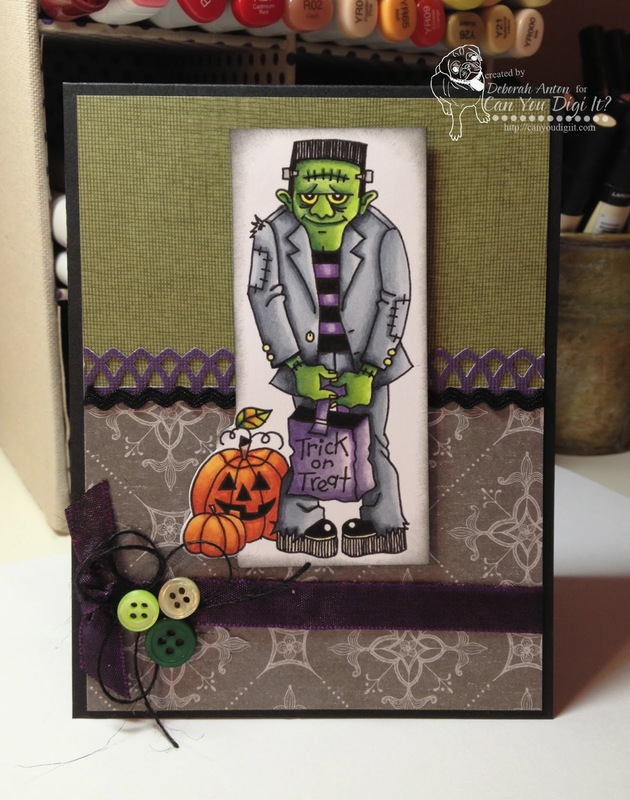 This weeks challenge is using Bailey Devil and make your creation shine and sparkle! That's right! Dust off that glitter, glimmer mists, stickels, anything that sparkles! 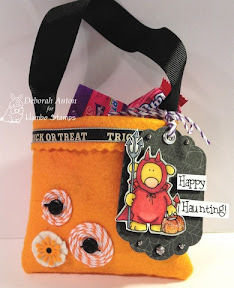 For my creation, I decided to use some felt and sew a little candy pouch. I used some twine and buttons to glue some circles on the front while the third is a flower using MFTs Dienamics. 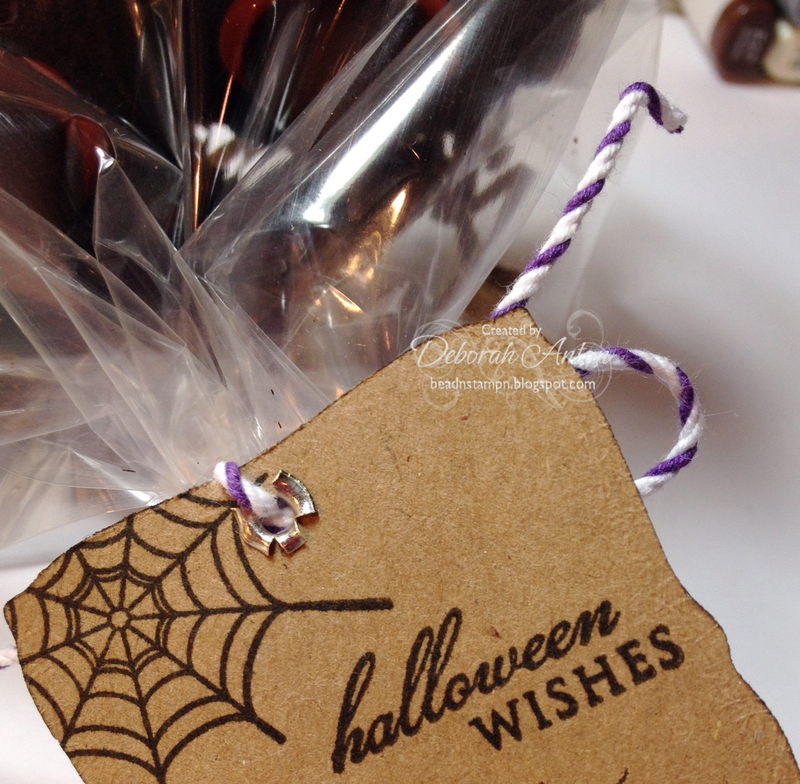 I created a tag with Bailey Devil and made his pumpkin and the enamel dots sparkle with Stickles. I glued some MS ribbon along the top to finish it off. 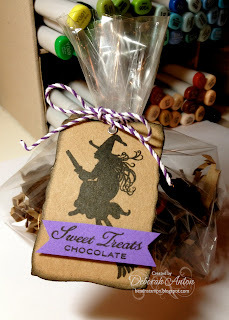 Just a simple treat pouch for giving! Thanks so much for stopping by and taking a peek today! Be sure to check out what the other Bacon Bits have created and perhaps play along with us! Make it a great day! I did get a happy email that I will share with you later but it was a nice end to my day! 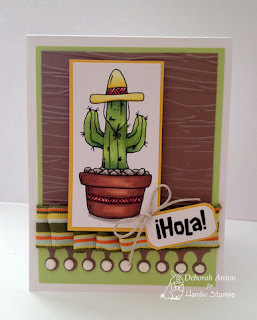 Right now, I will show you a one layer card I made for a CAS SCS Challenge last week using Hambo Stamps Corn Basket along with the coordinating stamp Aw Shucks! I love doing one layer cards as they make for quick 10 minutes cards and nice simplicity! For this one, I stamped the image and realized I used the wrong cs for coloring with my Copics. It would have bled through, so I decided to give my Prismacolor Pencils a dusting off and used those. No Gamsol was used for blending- just a blend of color. Thanks so much for stopping by! I hope you have a great energizer day! I am a stay at home spouse and mom to a wonderful husband of 15 years and 14 year old twin boys. Somewhere in between being a chauffer, chef, nurse, accountant, and domestic engineer extraordinaire, I love to design jewelry and craft and share it here with you! Text and pictures © Deborah Anton- Beadn&Stampn. All rights reserved. Nothing may be copied or changed without requesting permission from me. I have posted on here for personal inspiration only and you may not copy for submission to contests, magazines etc. Thank You! My day is not complete without a cup!